"the human faculty for thought, judgment, and emotion; the mental life, including both conscious and unconscious processes; the mind in its totality, as distinguished from the body"
So thought, judgment and emotion. How are they affected by the psychological effects of stress? Note that there are many definitions out there - I just like working with the medical ones, since I find definitions such as "soul and mind" too loose. Stress causes all sorts of emotions to build up almost instantly. A negative feeling you normally are able to control, can burst out suddenly and unexpected. These were just some of the common emotional responses that you can experience as psychological effects. Click here for more on stress anxiety and learn how to fight it. I don't want to sound like an all-out hippie, but listen to your body. Notice what your emotions tell you. Write them down on a piece of paper or download The Stressor Chart to help you map your causes of stress. 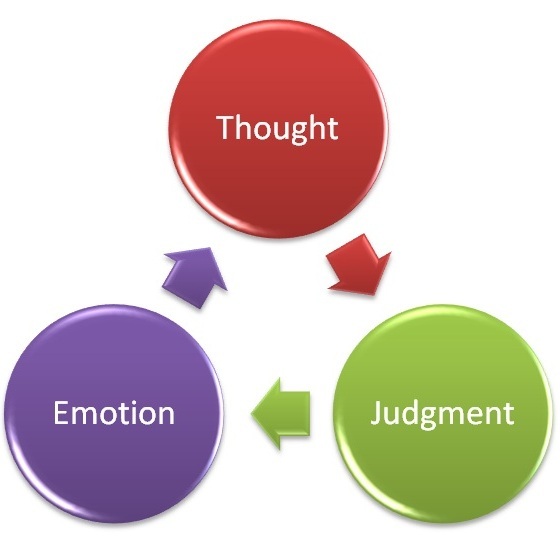 Thoughts can also come before emotions. They may trigger an emotional response as well. Now, I know that asking you to "think about what you are thinking", is hard. But that is however what we need to do. It is known that negative people (pessimists) are more prone to stress and they live shorter! If you expect the worst and get the worst, you suffer twice. If you expect the best and get the worst, you only suffer once. ... So if you are struggling with general negativity towards yourself and the world around you, try that simple mantra. Think positively! But back to the theme. Thoughts are wild and seem to appear out of nowhere! If you are thinking a lot about an upcoming event, let's say a football game, and you are nervous, try and visualize the worst possible scenario... no I'm serious! If you imagine the worst that can happen, you are putting fences up in your mind. You will be able to see the end of it so to speak. After that imagine two of the best scenarios. For example: You may make 3 touchdowns in the first and 5 in the second. What this will do for you is making you see more good outcomes, and it is a very effective coping technique. As said; one of th psychological effects of stress can sometimes be negative thoughts. If you are thinking the same thing to yourself over and over again, you will start to believe it, even if it isn't true. If your thoughts are more negative or get annoyed a lot, you can try the following. You can learn more about the psychological effects of stress and how to reduce stress in this section. The emotions and thoughts that you carry around every day affect how you act. And so, your judgment is affected. This should be an obvious fact, and there is nothing let than to say: You have to observe, recognize and realize that you don't have to be stressed. The most common long term effects only appear if you have lived with a high level of stress or many stressors in your life for some time. You are past your stress comfort zone. You can read more about Anxiety and the many other signs of stress here!